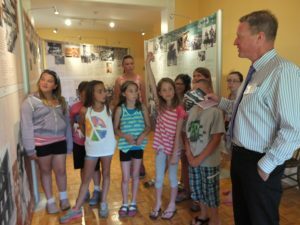 The Stratford Perth Museum has many exciting programs for school groups this year! Choose from a variety of curriculum-connected programs with customizable activities and content to suit your needs. We also offer guided and self-guided tours of the museum, as well as our walking trails. School groups also have the option of snowshoeing on our walking trails during the winter months. Education Manager Kayla Droog to discuss creating a new or customized program to fit your needs! Prices may vary for customized programs. Teachers and chaperones will be admitted for free, and are responsible for their groups at all times. Constant supervision is required. Teachers and chaperones are responsible for discipline and limiting disruptive behaviour. Please discuss museum etiquette with your class before visiting. A ratio of 1 chaperone per 5 students is recommended. Please follow your board guidelines. 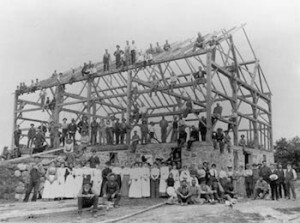 In this program, students will learn what life was like for early settlers of Stratford and Perth County. They will participate in historical games and activities such as grinding corn, carding wool, and washing laundry by hand. This program includes a craft for students to take home. This works best as an outdoor program, but indoor variations are available. In this program, younger students will learn how to navigate using maps, and older students will learn to use both maps and a compass. They will participate in interactive games that teach them how to read and examine a variety of maps, and will discuss various map elements and compass techniques. They will then put these new skills to use by following clues around the Museum’s walking trails. This works best as an outdoor program, but indoor variations are available. Let's Talk About Traditions and Celebrations! In this program, students will explore different pioneer Christmas celebrations and traditions. They will discuss the history of our modern Christmas celebrations, and how pioneer traditions differ from our traditions today. 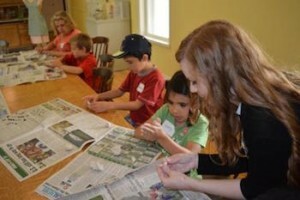 This program includes hands-on activities and crafts to take home. From clay tablets to iPhones, how have our communication methods changed over human history? 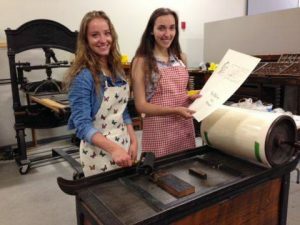 Learn about the rich history of letterpress and experience this early method of printed communication. This is a one-hour session full of learning and hands-on fun. Students will explore the Museum through an interactive tour that asks them to think about how people live and interact with their environment and community, both now and in the past. Walking trail tours can be incorporated into a museum tour, or are offered as an alternative. Student groups accompanied by teachers and chaperones are welcome to explore the Museum at their own pace. 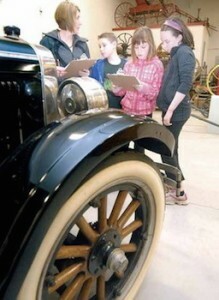 An optional Scavenger Hunt is available to help students explore and discuss the Museum’s current exhibits. Snowshoeing is offered in the winter on our walking trails. This activity is weather permitting. Snowshoeing is offered as a stand-alone activity, but it can also be incorporated into any of the programs we offer. Please contact Kayla Droog for more information. Rates will vary depending on the scope of the program.